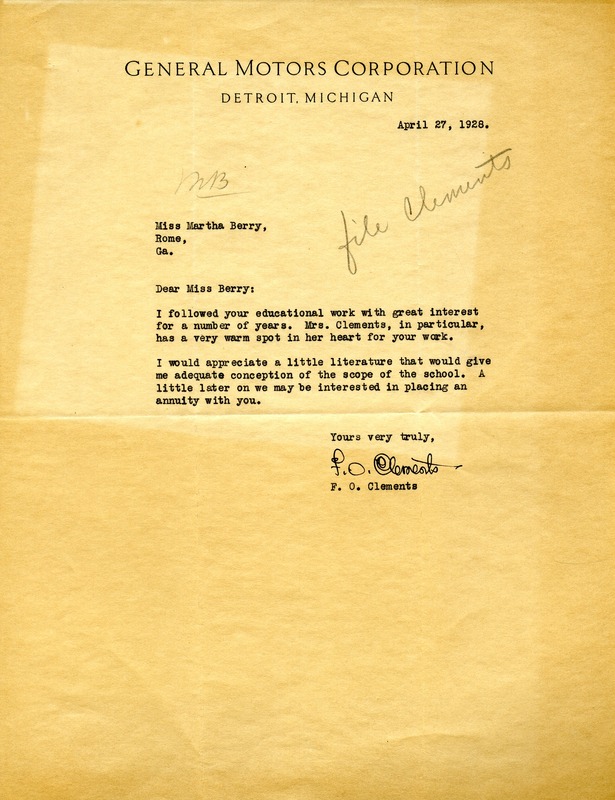 F. O. Clements of the General Motors Corporation writes to ask Martha Berry for some literature so he can evaluate the school and determine if, "a little later," they "may be interested in placing an annuity" with the school. He indicates that he and Mrs. Clements have followed the school with great interest. F. O. Clements, “Letter to Martha Berry from F. O. Clements.” Martha Berry Digital Archive. Eds. Schlitz, Stephanie A., Jordan Brannen, Chelsea Risley, Austin Amandolia, et al. Mount Berry: Berry College, 2012. accessed April 25, 2019, https://mbda.berry.edu/items/show/7019.